*UPDATE* It seems this image is fake and the Verizon Wireless pre-orders will start on Monday. 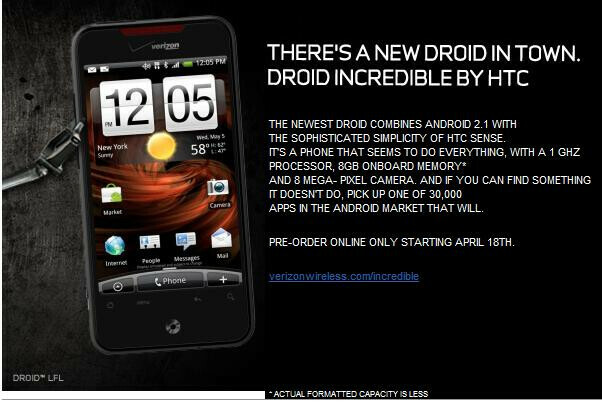 Just a few hours ago, we reported That Best Buy Mobile was going to start taking pre-orders for the studly,drool producing HTC Droid Incredible, starting today. Now, Big Red has decided to do the same thing and is accepting reservations for the handset on Sunday, as well. Originally, as we told you, the carrier was going to start pre-selling the model on Monday, but Best Buy Mobile's decision to start taking orders on Sunday has forced Verizon to move things up a day. Big Red is sending out this late breaking info via e-mails. And unlike Best Buy Mobile, Verizon will pre-sell the Droid Incredible through the Verizon web site only. The e-mail also notes that the actual formatted capacity of onboard memory is less than the 8GB listed, which confirms other reports. The handset is expected to ship and be in Verizon stores on April 29th while Best Buy is supposed to receive the phone on April 25th. Since when has Best Buy ever filled a rebate out for a customer? Rebates are the main reason I won't shop there, too much hassle to get the sticker price. As for the Incredible, all online phone orders take the rebate off the top with VZW. Best Buy has been giving all rebates up front on cell phones for over 9 months now. No extra paperwork at all. THIS POST IS WRONG! Quick phone arena fall back to your "this may not be accurate" disclosure. VZ You need to come out of the back room and see what is going on in the world the Verizon store smoke must be getting to you. Best Buy takes all the rebates you force your customers to mail in and discounts them at point of purchase. But if you want to lay out an extra $100 and get it back in the mail sometime that is your call. Check your sources. Apparently that email was a mistake. There is no where on the VZW site that you can preorder the incredible today. Yup, total fake. Pre-orders still begin tomorrow according to the VZW site, plus....I didn't get any such email, and I am registered for updates. 60 days til the Evo, nice try. I'll pass on the Imagio with Android. Oh you mean nice try sprint? Got it..I see almost pre's pixies and touch pro 2 holding sprint afloat right now and it's still not cutting it, the Evolution is far to advanced to make a big enough dent in there customer base. Granted its a sweet phone and I'm totally jealous, but its to technical for the mass crowed specially for what customer are left on sprint, (old people, and construction workers). My point is, it doesn't take any skill at all to work the iPhone any 5 year old can do it...it didn't sell a million phones because of just the advancements it had it sold a ton because it was easy to use and was advanced. Evolution smokes the iPhone like a Philly blunt,but wont spark the market of teens youth and older, it will be for technophiles...and that's not what sprint needs to stay afloat. Honestly I know its dumb but if sprint is going to survive the next 10 years they'll need an iPhone. 4g is a power play right now to attract new customers, but how many? I'd say you gain less than a million, my bet is Evo sells less than Droid. Marketing and positioning. 60 days 'til the 3% 4G coverage, 40% 3G coverage, and nationwide dial-up speeds. Yay. Maybe you can buy that EVO with a Verizon Mi-Fi so you can use it once you leave the confines of your local metropolis. I'd rather get the Incredible now and wait until the end of the year to get superior 3G and 4G coverage with Verizon's version of the Evo. 'Til then, I'll pass on an HD2 with Android and crappy coverage. Sprintguy... did you learn english writing yesterday? I had to reread this very slowly to try and interpret what you were saying. K, that's an Insult...the Droid Eris is far inferior in so many ways it can't even loom to be the same style or type. Check the specs Eris is like android in a wheel chair. Incredible is like android on steroids.